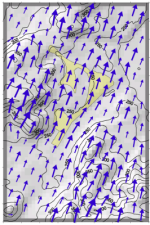 What is important in an area with a marked topographic structure is, besides cold-air flows, the local dynamic changes in the supraregional wind. 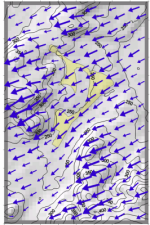 Like this, the wind direction can be canalised in valleys and significant changes in the wind speed can occur around hills. While higher wind speeds can be measured on knolls due to the nozzle effect, wind speeds are significantly lower in the wind shadow. The above-mentioned effects can be calculated for the city of Stuttgart with the help of the diagnostic wind field model and the DIWIMO calculation model (SCHÄDLER, 1996). 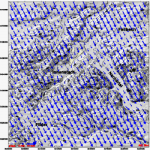 The influence of the topographic conditions on the wind field was analysed within Urban Climate 21 for the eight main wind directions (N, NE, E, SE, S, SW, W, NW). The basic assumption for the analysis was a neutral atmospheric stratification or a slight inversion condition as these are the average conditions in Stuttgart. The basic assumption for the calculations was a consistent inflow at an altitude of 700 m asl. with a wind speed of 10 m/s. The calculated wind directions and wind speeds apply to an altitude of 10 m above ground. 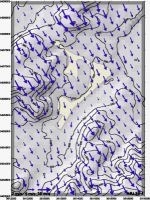 Figure 5-6 shows Stuttgart's flow field for the wind direction (inflow direction) NW. Figures 5-7, 5-8 and 5-9 show the situation for the plan area and for the wind directions SW, E and NW. What you can see clearly in each figure is the higher wind speeds on the knolls (Uhlandshöhe, Kriegsberg) and the considerably reduced wind speeds in the city basin and on the lee side of the hills. If you mingle the results from the wind field calculations with those of the cold-air flows and if you include the frequencies of individual situations, you receive wind roses as presented in chapter 5.4.